As we enter the busy holiday season, it’s easy to let family time suffer. I know this is the time of year when I want to slow down. I want to enjoy my family and really focus on Christ. But with busyness of the season, it can be hard. We have to be intentional to guard our family time. Family meal time is sacred for our family. Sometimes it is the only time of the day we actually sit down with one another without any distractions. 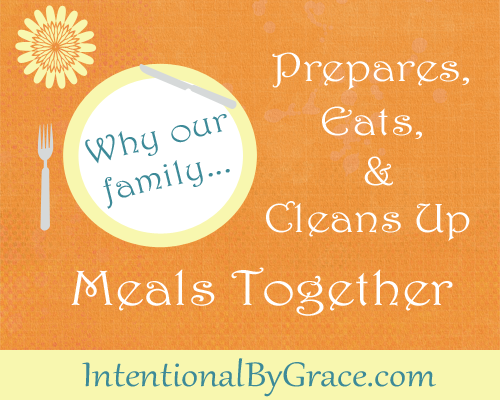 As much as we can, we prepare, eat, and clean up meals together as a family. We are a family. We are a team. As we seek to grow in Christ and become more like Him, serving is one way we can daily die to self and love our neighbor (our family) well. We want our children to understand what it means to serve (Galatians 5:13), and what better way to start than in the kitchen with mom and dad? 2. Teach children to care for themselves independently. Eventually, we want our children (yes our boys!) to know how to cook for themselves. As we prepare meals together, they are learning the kitchen skills needed to be independent. 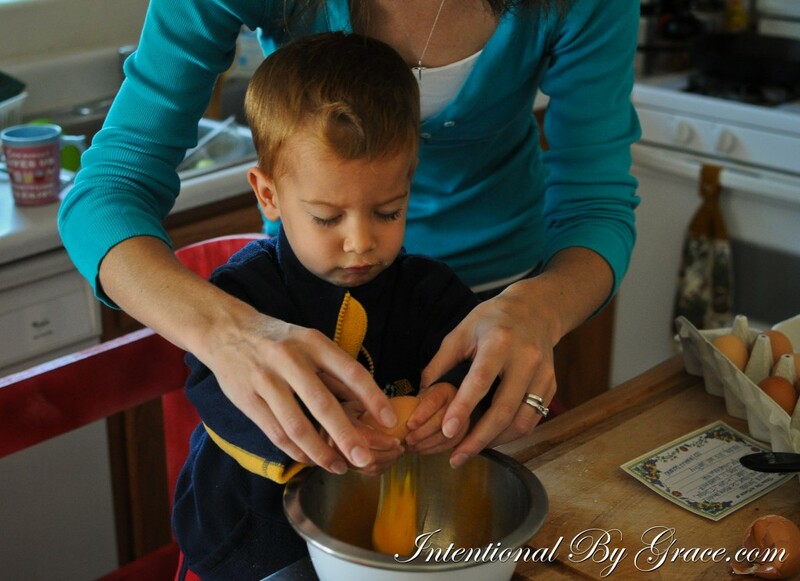 I’d love for my little men to be able to bless their wives one day with a home cooked meal when she’s had a long day! Granted, I tell my boys they aren’t getting married, but I guess that’s not up to me. I’ll train them anyway, I suppose. 3. Learn the art of real food. I’ve shared my journey into natural living with you. I want my boys to understand the reason we steward our health well, and for them to know what real food is and what it isn’t. By them joining us in preparing our meals, they learn to make good food choices as well as what it takes to run a real food kitchen. 4. Spend quality time together as a family. Time together as a family, creating memories, is a gift from God. As we prepare, eat, and clean up meals together, we are strengthening our bond as family and growing in fellowship with one another. Nothing solidifies a relationship like serving together, doing life together, and time in the kitchen around food is wonderful time spent with our family. 5. Utilize real life learning opportunities. As a homeschool family, the kitchen is a great school room. There are plenty of real life learning opportunities as we do life together in the kitchen. 6. Instill good habits that will go beyond our home and into future generations. 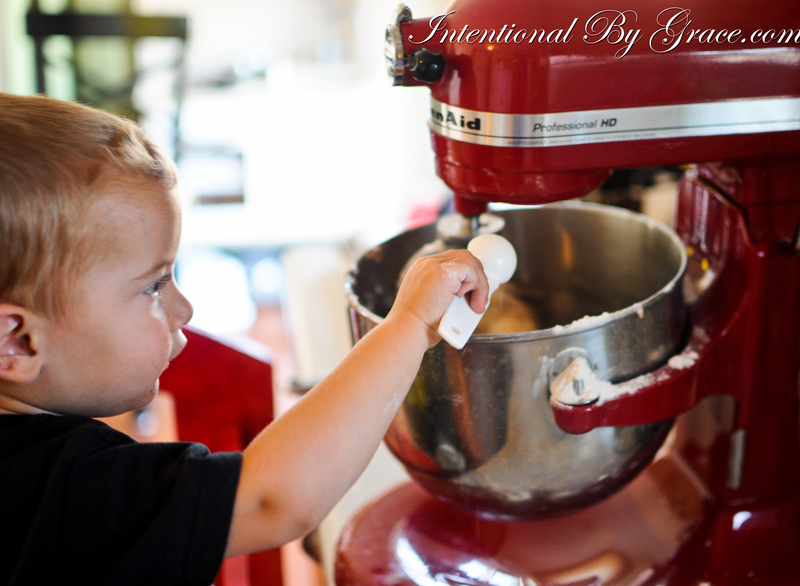 It is our prayer that our children will have fond memories of family time in the kitchen. We hope and pray this is a time of laughter and fun, a highlight of our day together. Family meal time is a habit we hope they enjoy and will in turn impart to their families one day. 7. Learn joy in doing life together. Family meals should be a joyful time. It is our goal to make it a time of laughter and fun. Therefore, our children will learn the joy of doing life together by preparing, eating, and cleaning up meals together. Just as we implement family clean up time, we have chosen to implement full family involvement in preparing, eating, and cleaning up meals. This means the entire burden to prepare and clean up meals doesn’t always fall squarely on mom’s shoulders. She has help from some of her favorite people! With each desire, we allow room for grace. Sometimes, Daddy gets home late and Mommy will shoo the boys out of the kitchen to play. Other times, Mommy hasn’t managed a shower all day so Daddy cooks while Mommy sneaks away. Then there are times we just don’t feel like cooking and get carry out. Grace! However, our ultimate goal in family meals is to prepare, eat, and clean up together to cultivate a life of servitude and joy as a family. During the busy holiday season, especially, we work hard to slow down around meal times so we can spend quality time together as a family. What about you? Do you implement family meal times together? Leigh Ann Dutton is the wife to the man of her prayers, Mark, and mama to three loveable little cherubs. She takes joy in spending her days creating memorable moments with her family, studying God's Word, reading good books, and enjoying God's creation. She does it all by the grace of God. We love the idea of family meal time but we often let that ideal slip to the side for other things like laziness, convenience, busyness. We are working on it though! I never really thought to include the kids in clean up after dinner. That’s such a great idea!!! I totally understand. That’s why I put in the grace paragraph. Sometimes it’s hard. Really hard. Thomas LOVES to sit on the counter to watch and help us cook. He’s done it pretty much since he could sit up! That’s great! Sam is the same way! 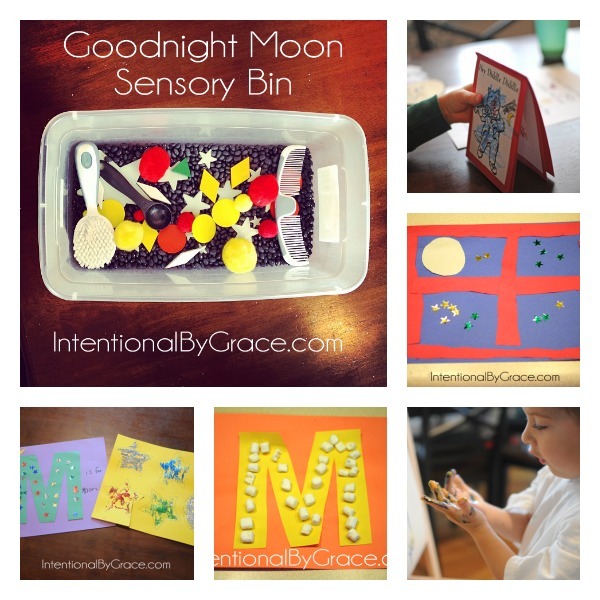 I think it’s great that you integrate your kids into meal prep and cleanup. My little girl loves making food with me, mostly baked goods- measuring flour, stirring, etc. We always make meals together as a family a priority and ask guests to follow suit i.e. no techie devices at the table and such. Thanks for the inspiration, Leigh Ann. Pinned. It’s the techie devices at the table that can be really hard. Sometimes it’s the only time the kids are quiet so I can get anything done. I have to work really hard to not make it a happen to check email, FB, etc. Thanks for these tips and reminders. I need to be doing a better job getting my 2 1/2 year old involved. Sometimes it is just easier to do it myself, but I need to remember that is not teaching him anything except that he doesn’t have to clean up after himself. When I was growing up, dinner was a big deal. I remember my mom making us stay at the table for 1 hour. I may not have appreciated it back then, but I sure do now! This list is so encouraging! I loved it from the first point. 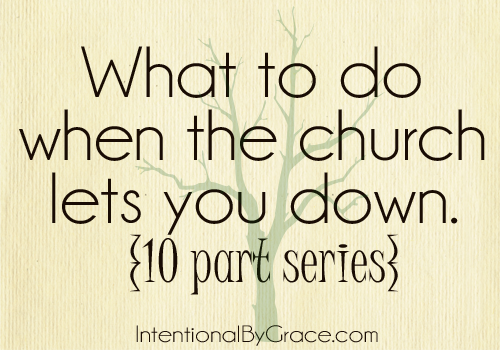 It was a great reminder to me…that meal time is about serving my family, not just a chore. I needed that encouragement! All the studies show why eating as a family is important. I love how your list includes preparing and cleaning. So many wonderful lessons to learn and memories to make!